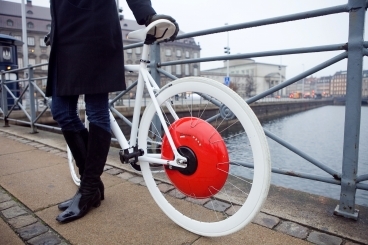 A team of students from MIT’s SENSEable Cities Lab have won the American round of the 2010 James Dyson Award for inventing the Copenhagen Wheel. This simple contraption transforms a regular peddle bicycle into a hybrid electric bike. The Copenhagen Wheel (PDF) employs a method used in Formula 1 race cars known has Kinetic Energy Recovery System (KERS). Normally when a car brakes, energy is created in the form of heat on the rotors and pads. In vehicles with KERS, that energy is captured and reused by the motor during acceleration. The Copenhagen Wheel works on the same principal. Energy from the braking is captured an electric motor, which generates a current that is stored on a battery. Later, when the rider is going uphill or needs extra speed, she can tap into that stored energy.